Does anybody have a comprehensive list of the M&P's TV appearances? Also, I remember reading something somewhere about a show on ABC I believe called Songwriters Special where the Mamas and Papas did "Boys and Girls Together". Is this accurate? Anyone have any more info? "THE SONGMAKERS (ABC, 10-11 p.m.). How to read the public taste and how to make a hit with it are the subjects; The Mamas and The Papas, Dionne Warwick, Simon and Garfunkel, and Songwriters Johnny Mercer and Burt Bacharach do the explaining." Unfortunately, I've never seen that. I have an audio tape of the program and it's quite interesting...it chronicles the group's recording of "Boys and Girls Together" and shows how they made "their sound." You've seen clips of it too--whenever they show the 'home movies' of The Ms and Ps--the footage of them sitting around in John and Michelle's house around the table and the color footage of them in the studio holding headphones to their ears are from this show (I think). Wow, this sounds like the holy grail of M&P's videos! Sure would be great if the video itself surfaced one day. Even just the audio sounds like it would be amazing! “Shindig!” (ABC-TV; first aired 12/11/65. Filmed at ABC Studios, Hollywood, CA). Songs performed: “I Call Your Name (acoustic version),” “Somebody Groovy” (live vocals over backing track), “California Dreamin’” (lip-synch), “Yesterday” (backing vocals for Barry McGuire; live vocals over backing track), “Do You Believe In Magic” (backing vocals for Barry McGuire; live vocals over backing track), “You’ve Got To Hide Your Love Away” (backing vocals for Barry McGuire; live vocals over backing track) and “Hang On Sloopy” (backing vocals for Barry McGuire; live vocals over backing track). “Shivaree” (ABC-TV; first aired 12/25/65. Filmed at KABC Studios, Hollywood, CA). Songs performed: “California Dreamin’” and “Somebody Groovy” (the latter running over the end credits). “Hollywood Palace” (ABC-TV; first aired 01/29/66. Repeated on 07/30/66. Filmed at The Hollywood Palace, Hollywood, CA). Songs performed: “California Dreamin’” (lip-synch) and “Be My Valentine” (the latter with the group singing live backup to Arthur Godfrey). “Hullabaloo” (NBC-TV; first aired 03/14/66. Repeated 08/08/66. Filmed at NBC Studios, Brooklyn, NY). Songs performed: “California Dreamin’,” “Nowhere Man” (part of a medley with other groups) and “Daydream” (The Mamas & The Papas sing one line of a verse in this ensemble version with Gary Lewis & The Playboys, Dionne Warwick, Bobby Rydell and Noel Harrison). “The Songmakers” (ABC-TV; first aired 02/24/67. Filmed at Western Recorders, Studio 3, Hollywood, CA). Songs performed: “Boys & Girls Together” (studio recording session from 12/01/66). For the appearances listed without mention of this, are these all lip-syncs or live vocal over backing tracks or a mix of the two? Also, is this not from a tv appearance? Let me inject what I remember from watching "The Songmakers" when it aired in '67. The group was sitting around a table in one of their homes. They each had handwritten "Boys & Girls" lyrics in front of them. They were discussing the arrangement. At one point, the camera was on one of the lyric sheets and a hand came in the shot (Michelle's I think) and drew a large question mark on the page over the lyrics. The studio scene showed the group doing a run-through of the song. Denny was singing lead, singing the part we know was eventually recorded by Cass and Michelle. When "The Songmakers" was repeated in the summer of '67, The M&P's portion was interrupted about two minutes in by President Johnson. I wanted to kick the TV screen in. Wow! 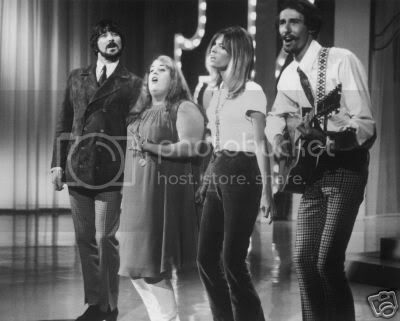 I heard about that show, but i never known that The Mamas And The Papas performed there a song "Boys And Girls". M&Ps did only 40-50 live appeariances at all, John said that in his interwiev. However, there's only about 20 videos on youtube and other sites, to watch. I miss an amazing footage of M&Ps on Shindig! (ABC), 1965, where M&Ps performed "Somebody Groovy", "Do You Believe In Magic", "You've got to hide your love away" (It was with Barry). I know that someone has all those footages, Michelle Phillips of cause has them, She used a lot of rare videos in "California Dreamin: The Songs of the mamas and papas" video released in 2004. I think She could make Her official channel on youtube. And there was a footage from "Straight Shooter", M&Ps live concert, i think it was in Phoenix, (maybe somebody knows, Cass was holding a wallpaper in that video which says "Cass is omnipotent") 'cause they had a tour all over USA, so there's one. But it was just a small piece of full lenght appearance, and even you can't predict what kind of song was in there. There's a lot of rarities in this world about M&Ps. I believe, one day they all come on publicity.